Green Apple group is bringing to you the most foot tapping music concert, so get set to enjoy Mika Reloaded concert. Mika Reloaded 2012 represents the fresh and New Mika, Every depiction going to be full of energy with reloaded fire. In association with Green Apple group, SBECCS is working for the upliftment of poor children. So, please join hands and be part of this concert so that we all can give education and other important facilities to poor people. Mika is not an unknown name. 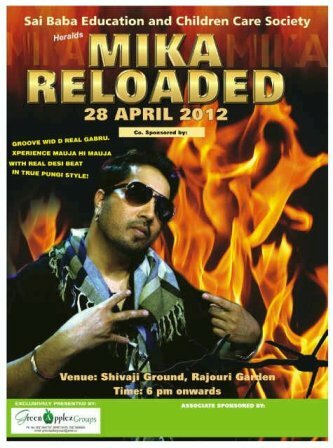 The Man who rendered the industry an unusual voice with his unique Sawan Mein Lag Gayi Aag is set to set fire again, but no Sawan here, all in Delhi Rajouri Garden Main ground on 28th April 2012. Singh is King, Jab we Met, Something Something and more recently Pungi from the movie Agent Vinod, Mika has captured the hearts of many with his funky attitude filled songs most of which are still huge hits at clubs and parties. 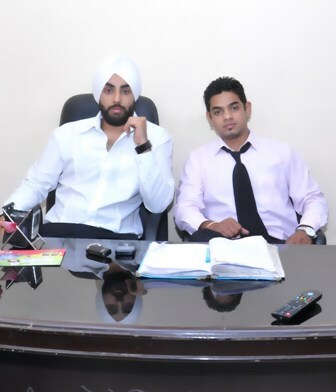 Mika worked very hard in the music industry and today he is as one of the more highly acclaimed Punjabi singers. The proof is very evident in the fact that he is a commercial success (with many hit songs) even as a playback singer even though that is not his forte. But That’s just about glitz and Glam the main highlight and purpose of the activity was conceived by Mr Nitin Khannawalia and Rajat Ahluwalia casting directors and owner of production house in Mumbai. It was soon that they realized importance of Education and awareness in kids who really wish to achieve and dare to dream in life, but due to lack of resources and uneducated family background they fail in same.”This is a initiative to raise voice for free and compulsory education in all forms be it schools or vocational, we tried to get successful people from each journey of life as inspiration and support and I guess the voice of MIKA is great way to spread the message” Says Lalit khannawalia from the organizer team. Our only urge is please support our cause, be the voice of change!